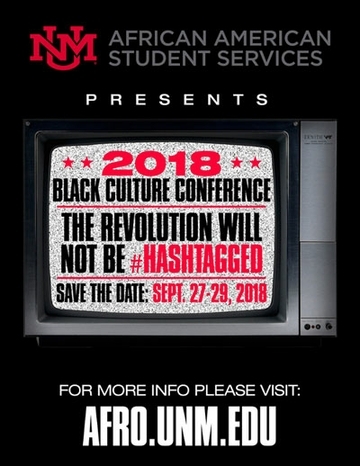 African American Student Services (AASS) at The University of New Mexico hosts the Black Cultural Conference, “The Revolution Will Not Be #Hashtagged” on Sept. 27-29. The 2018 “The Revolution will not be #Hashtagged” conference addresses a wide range of intersectional topics including education, leadership/professionalism, social justice and health. The keynote speaker for the Black Cultural Conference is John Carlos. Carlos is well known for his protest at the 1968 Mexico City Olympic Games where he wore black socks to represent poverty in Black communities and raised a black glove fist on the Olympic podium. 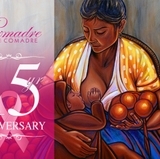 Registration for the conference is available through Sept. 20. High school student and chaperones are free, $40 for collegiate students and $75 for staff/faculty and community members. Registration includes attendance to all conference track presentations, conference keynote luncheon, Homecoming Step Show, Homecoming tailgate and game, continental breakfast and midday snacks/beverages and conference bags with Black Cultural Conference 2018 memorabilia. Individual event tickets are available. 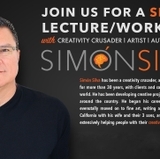 Tickets for the keynote address luncheon on Sept. 28 from 12 p.m. to 1:45 p.m. are available for $30. Tickets for the Homecoming Package are available for $25. To register or purchase single-event tickets, visit the registration page on the conference website. Dates and times are also available on the website. Contact Scott Carreathers, AASS director, with questions at 505-277-5645 or email afro@unm.edu.